Over the past few years, a robotic process automation has emerged as a new trend – an innovative and disruptive technology that companies can leverage to save time, money and resources through the automation of back office processes, as well as repetitive tasks. Business investment in robotic process automation will make a leap from a $216 million market in 2017 to an $870 million one by 2020. And RPA is now being used or investigated by 6 out of 10 Australian and New Zealand organizations surveyed in the Telsyte ANZ Robotic Process Automation Study 2017, according to Gizmodo. As every new trend, however, it also brings forth uncertainty about how its implementation will affect companies’ operational platform and their employees. UiPath talks extensively about the most common RPA myths on their blog, and going forward we will unmask 7 misconceptions about RPA and IT jobs. Some IT professionals may consider RPA a threat to their jobs, but software robots are a powerful asset that can free them from menial tasks. Let’s take a look at some unknown truths that debunk the most common RPA misconceptions, and explain how RPA is different from other BPM tools and why 38% of organizations with more than 500 employees from Australia and New Zealand already have an RPA program underway. The truth is that robotic process automation interfaces rely on the drag and drop principle to link steps in a process. As users do this, the code is generated automatically. Which means that business people with no coding skills can be trained to automate processes. 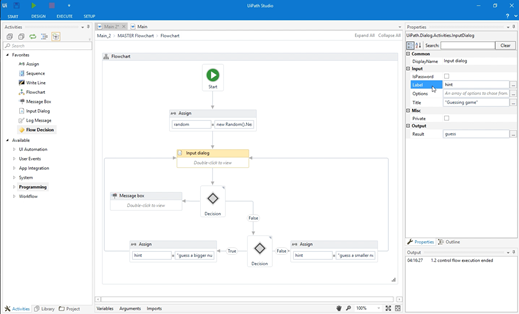 Take a look at the development environment from UiPath. At CiGen, we work with UiPath and below you can take a look at a screenshot of the development environment. According to “The Coming of Lightweight IT” by Bendik Bygstad, “lightweight IT” is a term used to describe front-end, commercially available software that supports processes and is typically adopted outside the control of the IT department. RPA is exactly that, meaning that it sits on top of existing systems. Unlike other BPM tools, it accesses data from the presentation layer using an ID and a password and does not store any of it. One of the most common RPA misconceptions is the idea that it builds software robots that interact in new ways with IT systems. On the contrary, the robot software is configured to learn specific rules and then press keys. There are what we call “back ofﬁce” robots that work unattended, and “front ofﬁce” robots that work hand in hand with customer-centered staff. The same IT terms of ‘developer’ and ‘designer’ are also used in RPA, but they refer to different roles and skill sets. This is definitely a great example of misperception coming from RPA using a language which is considered normally pertinent to an IT delivery function. This confusion leads some companies to believe that they can implement RPA in-house. According to a 2015 interview with their Head of Business Support, this happened to Leeds Building Society – who ended up wasting a lot of time and resources. Robotic process automation significantly eases the workload of the IT department, even being applied within IT function work itself. It is less costly than other BPM solutions, it can relieve pressure on the IT backlog and can be introduced quickly, with no major effort. RPA is a real asset for companies because it can be extended to many pressing business conundrums. A research into 26 IT-enabled innovation cases called “The IT Function and Robotic Process Automation” revealed that RPA implementation was more successful when it was business/user-led, rather than by the IT department. In these cases, RPA was initiated outside the IT department, then eventually operated at a low scale, carefully supervised by the IT function. Only once this department became involved at a higher level, and satisfied, RPA use escalated and an enterprise RPA capability was built, supported by both the IT and business unit, according to Professors Leslie Willcocks and Mary Lacity. When it comes to RPA governance, various approaches were found, depending on the history of the IT department in the organization. The question is whether existing governance structures could continue to integrate robotic process automation decisions and management within them, as well as the understanding and maturity of RPA in the business at any time. Most of those in favor of RPA manage to fit this concept within their current governance structure, then develop it as RPA expands into new business-related processes and, of course, across the business units. RPA can actually represent a big opportunity for IT departments from companies all over the world to raise their profiles, according to CIO. They can help the company identify the enterprise tasks that can be automated, but also develop interfaces across systems and applications to integrate and expand automation. Daniel is General Manager at CiGen, one of the first dedicated Robotic Process Automation companies based in Australia. He is passionate about intelligent automation, robotics automation consulting and bringing the benefits of digital robotics into the workplace.